The San Patricio Municipal Water District’s history is wrapped up in the mission of supporting jobs – jobs in manufacturing, tourism and businesses large and small. Having an adequate and dependable water supply means residents and businesses can make decisions and long-term investments with significant certainty. It means that builders can develop subdivisions and build homes and apartments with confidence. It means hotels, restaurants and shops can go into business to serve Winter Texans and summer tourists. And it means industries can invest millions and be assured adequate water will be available for operating their plants decades into the future. Thousands of employees, contract workers and vendors make their living in the heavy industries served directly or indirectly by the Water District. Reynolds Metals (now Sherwin Alumina) was the first of these back in 1952. 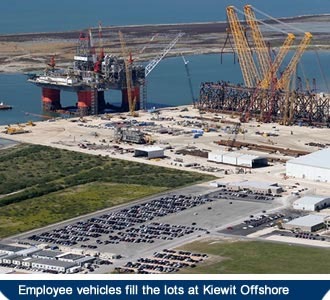 It was followed by DuPont, OxyChem, Air Liquide, Gregory Power Partners, Ingleside Cogen, Nashtec, Kiewit Offshore Services and Gulf Marine Fabricators. Together they generate more than 3,000 direct jobs and hundreds more during peak phases of fabrication projects. The District also provides water through the City of Ingleside to the Naval Station Ingleside redevelopment site that is anticipated to generate new employment in the coming years. And when investors and industries look for opportunities in the Coastal Bend they will find the San Patricio Municipal Water District is a cooperative and responsive water supplier with a long record of excellent customer relationships. The District serves a large - and growing - set of municipal and industrial water users in San Patricio, Aransas and Nueces counties. The water delivered to these users supports a large component of the Corpus Christ area's regional economy.